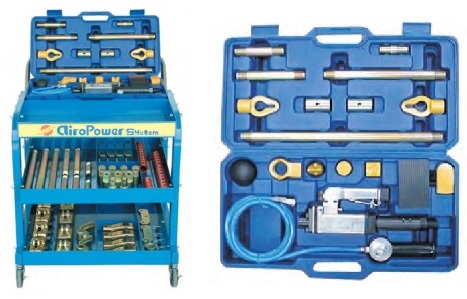 The Airopower system is a pneumatic body repair kit which is unique in the style, power and durability. Its uniqueness and efficiency will raise the level of standard body repairs. It offers to the body shop almost boundless possibilities in its various applications. The only pull and push jack in one body. Can work in restricted areas due to its small size. Push or pull at the click of a button. Complete professional system with numerous accessories. Push and pull capacity of over 5 tons.